I’m pretty sure this means that Decentraland will be onboarding Axie Infinity just like they did Etheremon! Partnering with Blockchain games that are far along the way of building an engaged community and gaming experience on the blockchain that is actually being used is a great strategy Decentraland are pushing for. Since the partnership seems to be in the works I decided to take a look into the game and see what potential there is. I’m more of an investor then a gamer but I have been obsessed with online games in the past so it’s always exciting to deep dive into these. On first glance the website and little details make you instantly comfortable in knowing the game was built by developers that know what they’re doing. The Axie Infinity team were speakers at the Nifty conference and seem committed to continue growing this game. There’s a really good interview I found you can read to get to know the team better. Axie Infinity seem like a wicked mashup of Crypto-kitties, Tamagotchi and Pokemon. The breeding aspect from Crypto-kitties is there but this seems to cleverly integrate with the battle aspect. Axies have different strengths and weaknesses and can fight against each other in battles of 3v3. There’s different ‘types’ like in Pokemon with some having strengths over others so you’re unit of 3 needs to be strategically chosen to cover each others weaknesses and maximize their strengths. The game intro does a great job of explaining everything you need to know. 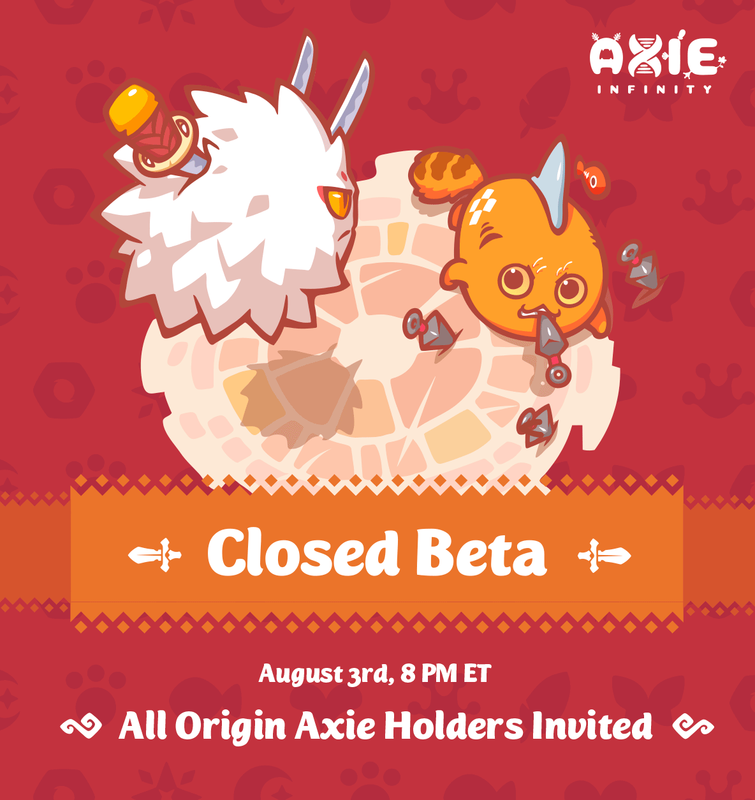 Seems if you’re an Origin Axie Holder you can participate in their closed Beta which will allow for battle testing and working with the devs. I’m more an investor than a gamer. Where there’s money to be made, you’ll find me sharking around looking for opportunity that others are missing. I was pretty stoked to find a thriving marketplace where people are trading these Axies. Some quick tips on what I’ve found to be valuable. Any Axie with an ‘origin’ tag means that it was bought from the Pre-game launch. There’s only a limited amount of these and I expect them to decrease heavily as more people get into the game. The cheapest one is at 0.15 Eth and there are plenty at around 0.2 Eth. Out of the 747 Axies on the marketplace, 478 have an ‘origin’ tag so there’s plenty of them on the market. Not rare enough yet. Axie eggs during Pre-game launch had a chance of having a ‘mystic’ body part which is rare and can evolve into a ‘legendary’. These are going for 0.6 minimum. Anything under that would be a good buy. It’s still early days and if there’s enough activity on the marketplace then I might look deeper to get a grasp on what’s valuable and what’s not. It’s definitely exciting to see Decentraland bring all these blockchain games together. They’ve made tremendous progress in the last couple of months but I still think they’re only scratching the surface. There’s plenty more to come I’m sure and with every successful game built on the blockchain comes more opportunity to collaborate!